The car park outside our space has just been repainted. 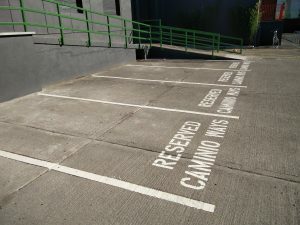 When visiting you can park in any of the spaces marked Caminio Ways. For more snaps visit our gallery. This was written by tdr. Posted on Monday, May 16, 2016, at 12:09 pm. Filed under News. Bookmark the permalink. Follow comments here with the RSS feed. Post a comment or leave a trackback.